Peterborough United Football Club is a professional football club in Peterborough, England, which plays in League One, the third tier of English football. 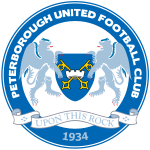 Peterborough United formed in 1934 and joined the Midland League, which they won six times, eventually being admitted to the Football League in 1960. Their home ground is London Road Stadium and the club nickname is The Posh. Their highest finishing position in the Football League was 10th in the Championship. Peterborough won the 2013–14 Football League Trophy. Peterborough United formed in 1934 at Peterborough's Angel Hotel to provide a replacement for Peterborough & Fletton United, who had folded two years previously. The Posh played in the old Midland League. They won this league on six occasions, including five seasons in a row from 1956 to 1960. The Posh were elected to The Football League for the beginning of the 1960–61 season, winning Division Four. Following the Fourth Division Championship success in 1960–61, The Posh spent seven seasons in the 3rd Division. They reached the quarter-finals of the 1964–65 FA Cup, beating Arsenal and Swansea Town along the way before going out to Chelsea. They were relegated back to the 4th Division for financial irregularities in the summer of 1968. The club took six seasons to return to Division 3, winning the 4th Division championship. In 1977–78 the club threatened to go one better until they narrowly missed out on promotion to Division 2 when they drew the last game of the season at champions Wrexham (0–0) when a win was needed to go up. The game was notable for the fact that over 2,000 Preston North End fans travelled to Wrexham to watch the game and cheer on the home side – Preston were the club who went up because Peterborough did not win. The Wrexham defeat cast a long shadow over the club and it fell into a long decline. Relegation followed in 1979 and Posh subsequently spent 12 years back in the 4th division. The 1980s was a long story of mismanagement and false dawns, punctuated by the odd cup run. In January 1991, Chris Turner, who had played in the 1974 Fourth division championship team took over as manager and the team embarked on a run of 13 unbeaten games that propelled them into the top four. Six players were signed on transfer deadline day, which at the time was a record for the number of players signed by one club on a single day. On the final day of the season, Posh travelled to Chesterfield needing a win to seal promotion. Despite going two goals down in the first ten minutes, the team rallied and drew level with goals from David Robinson and George Berry. However, Posh's closest rivals, Blackpool lost at Walsall and promotion was achieved. Gary Johnson left the club on 10 January 2011 due to policy disagreement. Two days after Johnson's departure, Darren Ferguson returned to the club on a four and a half-year contract. Peterborough finally finished 4th in 2010-11 Football League One with one of the worst defensive records in the third tier, conceding over 70 goals, but scoring 106; the most for anybody in the Football League that season. Peterborough beat Milton Keynes Dons in the playoff semi-finals. They defeated Huddersfield Town in the Final with a 3–0 victory, and gained promotion back to the Championship. In December 2016, as the United Kingdom football sexual abuse scandal expanded, it was revealed that alleged abuser Bob Higgins worked as a youth coach at Peterborough from May 1995 to April 1996. He was investigated as part of a 1997 Channel 4 Dispatches investigation, when he denied allegations of abuse, claiming he was a faith healer and born again Christian. On 5 July 2017, Higgins was charged with 65 counts of indecent assault. The offences were alleged to have taken place in the 1980s and 1990s and to have involved 23 alleged victims. He appeared at West Hampshire (Southampton) Magistrates' Court on 20 July, when he indicated he would plead not guilty to the alleged offences and was given unconditional bail until a hearing at Winchester Crown Court on 16 August 2017. At this hearing he did not enter a plea, but a provisional trial date was set for 9 April 2018. On 27 January 2017, it was reported that a second former Peterborough coach had been arrested; Michael Sean ‘Kit’ Carson, 73, academy director at Peterborough from 1993 to 2001 (overlapping with Bob Higgins for almost a year) was held in Cambridge on suspicion of indecency with children and indecent assault. He was released on bail the following day, but on 2 March 2018 was charged with 11 counts of indecent assault and one of inciting a child to engage in sexual activity. The alleged offences all involved boys under 16, and were said to have occurred from 1978 to 2009. Carson was due appear at Cambridge magistrates' court on 17 April 2018. Peterborough United are nicknamed "The Posh", a moniker coined in 1921, after Pat Tirrell, manager of Fletton United, was reported to say he was "Looking for posh players for a posh new team". When Fletton United looked to join the Southern League in 1923 they added Peterborough to their name to form Peterborough & Fletton United, in an attempt to gain the backing of businesses in Peterborough. Peterborough & Fletton United went bankrupt in October 1932 so the current club is the third to be known as The Posh. However, the term "posh" was used as a derogatory term for the club by the press. In 2002 Victoria Beckham filed a claim with the UK Patent Office over the club's use of the name "Posh". The former Spice Girl, who was known in the group as "Posh Spice", claimed the "nickname 'Posh' has become synonymous with her on a worldwide basis". She was unsuccessful in her suit. Since their formation Peterborough United have played their home games at London Road Stadium. The stand behind the London Road End is terraced while the Moy's End, is a rebuilt all-seater stand, and now known as the Motorpoint Stand. A 20,000 all-seater stadium to replace London Road has been proposed. The record attendance at the stadium is 30,096, achieved on 20 February 1965 in an FA Cup fifth-round game against Swansea Town. The ground was renamed as the ABAX Stadium in November 2014 as part of a five year sponsorship deal with Norwegian company ABAX. The first game at the renamed ground was against Bristol City, which Bristol won 3–0. According to the Football Fans Census, Cambridge United were considered to be the club's main rival. The Cambridge rivalry has been fought very evenly over the years; Peterborough winning 16 and Cambridge 15, with Peterborough netting 53 times and Cambridge 52 in the 38 competitive matches they have played each other. However, the two sides did not meet each other between 2001 and 2017 when they faced each other in the Checkatrade Trophy, a game which Peterborough won 2–0. Northampton Town are the traditional rival, dating back to when both sides were lower league, and as the city of Peterborough is historically part of Northamptonshire. Following Northampton's relegation from League One in 2018, the two teams are in separate divisions. More recently, Posh fans have begun to view the MK Dons as rivals, partly due to the geographic location, but also due to battling with the MK Dons for promotion from League Two and League One in Darren Ferguson's first two full seasons. ^ "Official Club Statement". theposh.com. 2 March 2018. Retrieved 2 March 2018. ^ "Club History". Peterborough United F.C. 9 May 2007. Archived from the original on 6 October 2008. Retrieved 10 June 2008. ^ a b c d e "Peterborough Official – Posh stats and records, updated 16/02/10". Theposh.com. Archived from the original on 4 October 2011. Retrieved 23 October 2011. ^ "Ferguson named Peterborough boss". BBC Sport. 20 January 2007. Retrieved 27 January 2014. ^ "Posh confirm Ferguson departure". BBC News. 12 January 2011. Retrieved 23 October 2011. ^ "Official Club Statement". Peterborough United F.C. 1 February 2010. Retrieved 1 February 2010. ^ "Peterborough appoint Jim Gannon to replace Mark Cooper". The Guardian. UK. 2 February 2010. Retrieved 2 February 2010. ^ "Gary Johnson confirmed as new Peterborough manager". The Guardian. UK. 6 April 2010. Retrieved 6 April 2010. ^ "Official Club Statement". Peterborough United F.C. 10 January 2011. Retrieved 11 January 2011. ^ a b James, Stuart; Morris, Steven (5 December 2016). "Football League warned all its clubs about Bob Higgins in 1989". The Guardian. Retrieved 5 December 2016. ^ Morris, Steven (27 January 2017). "Ex-Peterborough United coach arrested in sexual abuse investigation". The Guardian. Retrieved 29 January 2017. ^ "How Peterborough United got their nickname". Peterborough Telegraph. 3 April 2009. Retrieved 10 March 2015. ^ "How Peterborough United got their nickname". ^ "Dirty fight for Posh name". BBC News. 5 November 2002. ^ Adlam, Phil. "Welcome To The ABAX Stadium". ^ "Peterborough United's London Road renamed Abax Stadium". 26 November 2014 – via www.bbc.co.uk. ^ "Peterborough United 0–3 Bristol City". 28 November 2014 – via www.bbc.co.uk. ^ "Cambridge United Head-to-Head". statto.com. Retrieved 23 October 2011. ^ Mark Lawford (13 March 2009). "Millwall v West Ham, Brighton v Palace, Aberdeen v Rangers – and more: Sportsmail's guide to illogical footballing rivalries". Daily Mail. London. ^ "Championship fixtures 2012–13: Posh start with derby date". Peterborough Telegraph. 18 June 2012. Retrieved 26 April 2013. ^ Swann, Alan. "World of Sport: Thankfully Posh are not Cobblers". Peterborough Telegraph. Retrieved 26 April 2013. ^ "First Team". Peterborough United Official Site. Retrieved 15 December 2017. ^ "Posh name their new skipper". Peterborough Telegraph. 29 July 2018. Retrieved 29 July 2018. ^ "Posh name their new skipper". Peterborough Telegraph. 29 July 2018. Retrieved 14 August 2018. ^ "Club Announce Squad Numbers". Peterborough United. 3 July 2017. Retrieved 1 August 2018. ^ "Who's Who? - Peterborough United". www.theposh.com. Retrieved 2 October 2018. ^ "Managers". The Posh Trust. Retrieved 26 March 2019. ^ In charge for a match as Martin Wilkinson was in hospital with appendicitis. Wikimedia Commons has media related to Peterborough United F.C..